I’ve recently been playing with Homebridge on my Raspberry Pi. I’ve setup my Harmony Hub and my wireless power outlets to be controlled by Siri on my iPhone. Overall it has been pretty simple to setup but I did run into an issue trying to get Homebridge to start on bootup. Homebridge suggest 3 different methods. I decided to use systemd to start Homebridge on bootup. I prefered this method because it will restart if an error occurs. I followed the gist setup step by step but ran into some problems. This copies your current user’s config. This assumes you have already added accessories etc. Type systemctl status homebridge to check the status of the service. Hopefully this helps anyone who is having trouble with Homebridge starting on boot on a Raspberry Pi. Please comment below if you have any questions. These instructions were great. However, still no go. Firstly, you included ‘sudo’ up to step 8. Then stopped. This correct? Because I get a failure when I don’t include it. Oct 15 00:27:51 raspberrypi systemd: Unit homebridge.service entered fail…. This error is annoying me. I am pretty new to this, and have followed the steps here and on the other page where you linked from. No luck. Any ideas? Sudo is required. I’ll update the steps. Can you get the full error message? Use -l? Sorry. New to SSH today. Whats -l? Any other info? Is this on a raspberry pi? Yes. Brand New Raspberry Pi 3. Steps 5 and 6 are creating folders, who should be the owner of these? homebridge? Ah, finally got it working thanks to your guide! Awesome! Great! Glad you got it to work. Hi, at step 3 I ran in an issue. Have here a Raspberry Pi 2 with Jessie. The user will not be added. Did you try it with sudo in front? Have found the typo. It should be “sudo useradd –system homebridge”. Thanks for pointing this out. The dashes were there but the font used was showing it as a solid line. I fixed it to make it clearer. Great, now it works! Thank you! Hi Tim, thanks so much for this article. Will steps 5 onwards need to be repeated every time the config file is updated? You shouldn’t have to copy the file. Just make sure you edit the correct confit file. Nov 11 09:52:32 raspberry systemd: Unit homebridge.service entered failed state. Nov 11 09:40:32 raspberrypi systemd: Started Node.js HomeKit Server. Nov 11 09:40:32 raspberrypi systemd: Unit homebridge.service entered failed state. Nov 11 09:40:42 raspberrypi systemd: homebridge.service holdoff time over, scheduling restart. Nov 11 09:40:42 raspberrypi systemd: Started Node.js HomeKit Server. Nov 11 09:40:42 raspberrypi systemd: Unit homebridge.service entered failed state. Nov 11 09:40:53 raspberrypi systemd: homebridge.service holdoff time over, scheduling restart. Nov 11 09:40:53 raspberrypi systemd: Started Node.js HomeKit Server. Nov 11 09:40:53 raspberrypi systemd: Unit homebridge.service entered failed state. Nov 11 09:41:03 raspberrypi systemd: homebridge.service holdoff time over, scheduling restart. Nov 11 09:41:03 raspberrypi systemd: Started Node.js HomeKit Server. Hi, all went ok, thank you! now i’m in trouble when adding a new one plugin and edit the config.json. i can install the plugin correctly, i edit the config.json (lacated in /var/homebridge : the new path) but the service can’t start. have i to do something else? roll-back to the old config.json configuration and all works like before.. the json was validated online so it doesn’t seem a json’s valid file.. maybe the plugin? It seems step #6 is a critical one to make the whole thing working. In the original manual https://github.com/nfarina/homebridge/wiki/Running-HomeBridge-on-a-Raspberry-Pi was no any suggestions on copying “~/.homebridge/persist”. So the WeMo plugin didn’t start for me in service mode. With this step it works great. Thanks! I also ran into several issues following the original instructions. Glad this helped! Dec 14 18:49:44 ubuntu systemd: homebridge.service: Unit entered failed state. Dec 14 18:49:44 ubuntu systemd: homebridge.service: Failed with result ‘exit-code’. Do you have any other info? I used Rasbian for this guide. I can’t find any log files to help and despite uncommenting the DEBUG=*line in /etc/default/homebridge, journalctl just comes back with no entries found. Can you give pointers as to where I may look for errors/get jornaling working? Without an error message I’m not really sure what could be causing it. You could try follow the steps again and make sure you didn’t miss anything. Lifx bulb gets loaded but right after, I get a dns service error:name conflict. Any ideas? Appreciate the post was very helpful and thanks in advance. Thanks! Double check your json config to see if any accessories are named the same. Have you looked at the advertisement.js: file? I also managed to install homebridge alright. Had trouble though getting it to boot on startup, followed your steps and, success! I uncommented the “DEBUG=*” line, but don’t know where to look for the log file. No journal files were found…. And I need it in a log file for the HomeBridge Server plugin. Tim, I need your help again. Home bridge was not found a couple hours after your help the other day; I started fresh to see if I missed something yesterday. and it took a couple hours to stop again. I also disabled power management for wifi to keep it from going to sleep. it says that it is active, yet homebridge will not show up once removed. Please look below. Jan 11 00:28:33 raspberrypi systemd: Started Node.js HomeKit Server. I currently use wifi and I’ve didn’t have to disable power management on mine. Did restarting the pi fix the issue? I followed your guide and now my homebridge works like a charm! Just a question: what’s the config.json that have to be modified now? The one in ~/.homebridge or the other in /var/homebridge ? Great! You’ll want to edit the one in /var/homebridge. Let me know if you have any other questions. Just a suggestion … rename the ~/.homebridge directory to something else to avoid confusion. Everything works perfect using this guide! however not sure how to change / update config.json I changed a few items but they are not reflected in the Homekit. Do i need to stop process and reload? Reboot does not help. Thank you for posting this, it seems the wiki instructions are still not complete :). Worked fine for me. Great glad it helped! I ran into the same issue. once I try to log in to homebridge it just goes in a loop, back to login. I can log in to PI fine, yet not homebridge. it goes blank and ask for my login again. I have ran in to this twice now, the first time I sent it in to recovery and loaded a new Jessie on my rpi3. Is there a way to do steps 4-10 logged in as Pi? Thank you for your help. Hey Shawn try follow these steps. I don’t think it is necessary to create a new user. I was able to do it able logged in as pi. Tim, you are the smartest guy around. This was a simple process thanks to you. I wasted an half a day on that other site, and a an hour on google trying to find the fix. Thank you Sir. Thanks! Glad you got it. Jan 09 03:55:50 RazHome systemd: Unit homebridge.service entered failed …e. Check out this article. It may help with running it as a service. Hi, i have tested this and I end up with a error when i try to enable homebridge.. Worked like a charm. I only wish I would have found this the first time I tried to do this a couple months ago! This time… very smooth process with no hiccups. Running on a Raspberry Pi 3 – I followed the instructions in the Wiki (https://github.com/nfarina/homebridge/wiki/Running-HomeBridge-on-a-Raspberry-Pi) which linked to your site for the systemd instructions. It works for me but I am not able to stop home bridge. Which commands do I need to simply stop home bridge if I temporary need to start it manually? insserv: Script homebridge is broken: incomplete LSB comment. insserv: missing valid name for `Provides:’ please add. I have 2 things to helpout with. Second if anyone is having couldn’t connect to this accessory from device to homebridge verify how many accessories you have, I have one platform openHAB but every accessory created in it or item is concidered an accessory. there is no error for over 100 accessories and 100 is the max per homebridge. For the openhab to homebrige addon there is a skipitem true function you can add to your config.json which will not sync the items you do not need. This will take time to sync mine took around 24 hours before I could access the accessories just use the journal line above and once it starts showing your accessories getting data not resgitering you will be good. I struggled with NFarinas and the main guide too. had to reinstall RPI from scratch! Twice… so I am nervous about following your process. I have homebridge up and running manualy with 2 plugins (Smartthings and nest) working fine. Your approach has some subtle differences. 1. Nfarina’s guide suggests /var/lib/homebridge as the directory …you and others seem to be using just var/homebridge.. Is there a reason for this? 2. This means we would have to edit the homebridge file in etc/defaults/because it references var/lib/homebridge. Is this correct? 3. on my previous attempts it wouldn’t find the plugins or the accessories… \I read posts about copying the persist folder but it didn’t seem to work 100% . Any thoughts? Folder structure is most likely bc of different operating systems. Are you installing it on a raspberry pi? You should be fine modifying the steps if your directories are different. I’m having a little trouble. Just running the homebridge binary works flawlessly, the service on the other hand does not. Thanks, and by the way, thanks for a great guide! Haven’t had the opportunity to test yet but I’m curious as to why there’s $HOMEBRIDGE_OPTS in the service when it’s not needed when starting manually, shouldn’t be necessary? Got it working now, went step by step again and it turned out I’d forgotten the “-R” flag when copying the “persist” directory so it was just an empty folder! Hi, firstly thanks for posting this run through, so much clearer than the official documentation. I ran into a problem at step 9 though, after typing “sudo systemctl enable homebridge” i get an ERROR: Invalid argument response. Any idea why? I found my problem. I hadn’t copied the whole gist, I had left out the last t from the end of the word “target” in homebridge.service, once I edited the file I could run the enable command no problem. Now homebridge runs all the time, every time! Thank you so, so much for posting these instructions. I must therefore have failed to create the directory. Hi, my apologies. I managed to save the gists. Hmm do you see any other error messages? Hi Tim, thank you but I realised that I had a typo in one of the files. All working now! Thank you very much. Hi, I’m getting the same error as you. What file was the typo in? Just found this page. I have been struggling to set up Homebridge on my PI. This looks really helpful. Think I will start again from scratch rather than try and overlay onto what does not work now. Just need a couple of hours over next few days. Hopefully will not need to comeback to you! Great let me know if I can help! I’m sorry to plague you for advice. I have homebridge running on boot up of my Raspberry Pi 3 as guided by your instructions above re systemd. I was hoping to install a second plugin, in addition to the one governing my LIFX lightbulbs. I don’t seem to have permission to install the second plugin. Would you have any advice re how to do so? Did you try adding sudo in front of the npm install command? I’m sorry, I realise that was the equivalent of not trying the plug it out plug it back in approach. Sorry, I’m a newbie! Thanks for your help, I’ve managed to get it installed! Would you also be able to tell me how to edit the config.json on my raspberry pi from the command line (I’ve sshed in to a headless system). it just seems to have worked without me evening editing the config file! I can see my wemo devices and they all work! I’m not entirely sure what to make of that, but I’m happy! I followed this and was able to get it working! but only temporarily. If I run `systemctl status homebridge` a few times, I can see that it starts up for a couple seconds, but then gets killed and is usually in the auto-restart state. Did you ever run into this problem? No I did not. Are you seeing any errors? I found a fix, which was to comment out the `User=homebridge` in the homebridge.service file. I had my homebridge working as an accessory in HomeKit before, when I ran `sudo homebridge`. But when it is running as a service, my HomeKit app does not find the accessory. Is this a different instance of homebridge? It was something relating to the config. I think the problem was that the copied config.json from my non-bootup setup had the same bridge name/username/HomeKit PIN. I’m not sure which of the above it is, but I changed all 3 to be a new unique value, added that new accessory to HomeKit, and it works now. Hi Tim thought I was doing so well. I got Homebrige running but did not put in any accessories. Then went and got half way through start on boot and realised with no accessories i needed to stop. Tried to load an accessory and getting an error. Hi the sudo command as you suggested has moved me forward. [4/13/2017, 1:37:25 PM] config.json (/home/pi/.homebridge/config.json) not found. Is now what is causing the problem. The accessory is showing . [4/13/2017, 1:37:25 PM] Homebridge is running on port 46058. Hi Tim sorry to keep sending so many posts but making progress. I put a config.json file in the home bridge folder and now get this error. [4/13/2017, 2:48:35 PM] There was a problem reading your config.json file. Maybe I am not copying it in correctly? Hi Tim, Im newbie here and just managed to finish all the setup. but can you provide the result of “systemctl status homebridge”, Im a bit confused here whether my systemd bootup is running or not. Also I configure my rasp-pi 3 with ssh on mac, when I run $ homebridge in the terminal, its running successfully. What should i do to keep it running because when i quit the terminal (Command+q), the homebridge hub in my iphone home app has no response which means it stopped running. Is there some command that I miss here? You shouldn’t have to run it manually in the terminal. Once you reboot, it should automatically start. Yes, ive tried that and still not working. When i plug my hdmi monitor to my rasp-pi, its stucked at login page. What do you mean stuck? It needs to put the username and the password. So the login page. I would recommend going through the steps again to see if you missed anything. You shouldn’t have to login. It should start automatically. Just one question: now when I enter $ homebridge it gives me the error that homebridge is already in use (which of course it is). No problem, except what happens when I want to make a change to homebridge? How do I kill the process and start it again manually in a new command line window? Hi! Great tutorial but I messed some stuff up and I think I have multiple instances of Homebridge running now and it’s not working properly. How do I remove homebridge and reinstall it now that I have it running on startup? Thanks! Have you tried restarting? The other one shouldn’t start. Why not using the original ~/.homebridge/config.json instead? I have followed your instructions (which was great btw.) however I seem to have the same problem as someone before me has reported. If I start it manually (i.e. typing homebridge), I can see it loading accessories etc. and works like a charm (it loads using the pi user). However, when I load it on boot it seems to crash every 10 seconds or so and then restarts. I tried as above, changing in the original config.json file (name, PIN etc. ), did not work. I also tried to comment out the User in the service file, did not work. As a workaround I’m now running the service as pi and point to the original config.json. I’m not at home right now so I’m not sure if it works but it doesn’t crash now at least. Thanks for the great tutorial. I seem to be having a few permission issues with a couple of my plugins when attempting to get the service up and running. “Jul 03 13:26:19 UbuntuServer homebridge: [7/3/2017, 1:26:19 PM] Loaded config.json with 0 accessories and 3 platforms. Jul 03 13:26:19 UbuntuServer homebridge: Error: The requested platform ‘HarmonyHub’ was not registered by any plugin. -It appears there is some kind of permission issue with my ISYMaker and HarmonyHub plugins. If you have any suggestions how to fix my permission issues I would sure appreciate it. Thanks glad it’s helped! Try removing the user from the homebridge.service file. Also check out this guide on running linux programs on start. Are you seeing any errors? Could be a permission issues since it works when you run it but not on bootup. Also you may want to check out this post. Jul 31 13:31:26 Pixel-Pi systemd: Unit homebridge.service entered failed state. I can run the home bridge code from the command line but not as a service. I have set other software up as a service, but can’t seem to get homebridge to run. Also I have not found a definitive answer to this error. I’m still searching through the google search. Do you have quick answer? drwxrwxrwx 2 root root 4.0K Jul 19 10:10 .
drwxr-xr-x 52 root root 4.0K Jul 19 10:08 ..
sudo systemctl status homebridge tells me it’s running, but it’s not. What does your config.json look like? Is there something that is causing this TypeError: Path must be a string. Received undefined? I wrote another post that simplified running something on boot that may help. Aug 17 14:12:19 Homebridge systemd: Unit HB.service entered failed state. Should I have “sudo homebridge” in the service file? Thanks for any help you have in solving this issue. Is homebridge not located in /usr/local/bin/homebridge ? Should I make a link in /use/local/bin? I’ve read both and tried both posts. The second one is the latest I tried and get the current error. Quick question. With this method is there a way to view a log/access the output that homebridge usually displays on running? I like to check the times of events and I can’t find another way to access it. Thanks! Have you tried journalctl -u homebridge.service Let me know if that works. I also can’t get homebridge to work with systemd, tried everything mentioned on several sites, with different locations, users. It just won’t run via systems. (it does work in the cli). homebridge.service: Unit entered failed state. got my home bridge starting automatically following your tip! I even rebooted the Pi and it came right back. Thanks Jeff and Tim! Awesome glad to hear it worked! It’s failing for me :(, can you please help. Sep 16 09:23:17 prashant_home systemd: homebridge.service: Unit entered failed state. My Homebridge works well on my Raspberry Pi 3, but I cannot get autostart to work using the guidelines. I had the exact same problem, I figured out the user was the issue. When changing to my default PI user, the issue was gone and service is running. If anyone can suggest another approach of doing it correctly with the ‘homebridge’ user (which requires a password and that was the problem if i’m not wrong), please share. Just to say Thank you very much, I have some difficult to start my home bridge at startup and with your steps it’s works fine !! BUT when I go on my phone homekit doesn’t work, and in order to switch on my lights I have to start “homebridge” manually. Are you using the same config when running it manually? Yes, copied through step 5. I’ll have to go through this again. Maybe homebridge has been updated. I don’t understand why create another user (called homebridge, too, to confuse ideas to noobs!).. should I do something with that user? If I try to switch from pi user to homebridge user, it asks me a password, which password? I had the same issue. I had to remove the bridge from my Home app and then re-pair it with the auto-started instance (even using the same HomeKit code) before it would work with the autostarted one. Seems that re-pairing is required if you have paired it first with manual instance. Hi, I’m new to all this and started out reading how to setup my homebridge on https://github.com/nfarina/homebridge/wiki/Running-HomeBridge-on-a-Raspberry-Pi#install-avahi-and-other-dependencies. The post refers to the post above in case you encounter some difficulties (aka troubleshooting). In the first post the homebridge config is stored in /var/homebridge, while in the post above the dir /var/lib/homebridge is used. Be sure the locations in you config are matching the directories you’ll be creating, so pick one or the other. After correcting the post above did the job for me, thanks! I’m new about “Raspberry PI” and homebridge application, I tried to apply Your tips, but unfortunately doesn’t work . It seem it start but after few seconds the status is FAILURE. My understanding is that if I start homebridge using “sudo systemctl start homebridge” do not load plug-in (I use Fibaro-HC2), but if I start homebridge by command line it works fine. How I can assign the right permissions to the homebridge user? I have constantly crashes with home ridge. Can you help me out or give me any advice. I created the trouble by installing a third party app from iOS AppStore. But I installed homebridge with systemd. Now both are making my install unstable. How do I get rid of the Init.d boot Up? I believe that I should keep systemd?? Eadrinuse with a number or something. And a whole lot of text. Also I see in the cpu usage in the top bar (nearby the network logo) a constant returning peak! Every 10 sec. then I see in the task manager homebridge usage going to 25%. And I see to time homebridge process. By 2 usernames. Pi an homebridge. So that’s why I concluded it is trying to double start. Yet no success, while all is running. Can’t get the Homebridge going. 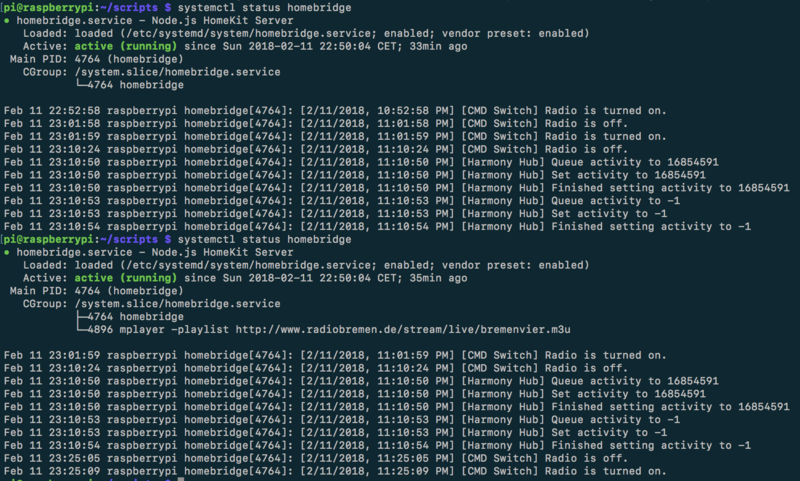 So I am confused, why is it that my Homebridge is not running smoothly…. Looks like it should be working. Could be a file permission error. Is there a way to install npm to the right location? You could try installing it globally? Can I see a sample config.json? the one I have is failing the json lint page. I have done all these steps, seem no errors in the logs. The HomeKit app shows them as responding, they seem to think they turn on when they just don’t. Any ideas? It worked before I added it with bootup. What devices are you using in Homebridge? Most likely a permission error. I was using the Harmony plugin which I think was the reason as it works when I only run the Hue plugin. Thanks for your help though! Happy new year! Hello, how did you solve this? I have exactly the same problem. I recently added some new “accessories” to the config.json file and the homebridge service is running without errors, but now my phone cannot find the Crekit accessory anymore. Is this still compatible with iOS 11? Hmm mine still works and I’m using iOS 11.2.1. Try removing the accessories to see if it works. Thanks for the confirmation. It works again after I deleted the persist/ directory as suggested in the “Common Issues” section of the homebridge installation readme. Thank you for your post. It worked perfectly the first time around. If you make sure the folders and files are created in the right location (not just create them and hope they are where they need to be) then the instructions work well and Homebridge starts right up. You just have to take a few extra seconds to ensure the files you create on steps 1 and 2 are created correctly! Why you dont move the accesories folder too ? You only move the persist folder…..
…and can i use user “root” …..
I’m getting the following error. please help. update: no longer getting the above error. now getting the below. I’ve followed all the steps and still the boot up isn’t working. help! Feb 03 15:04:57 raspberrypi systemd: homebridge.service: Unit entered failed state. Feb 03 15:04:57 raspberrypi systemd: homebridge.service: Failed with result ‘exit-code’. Noobee here… Thanks for publishing… After completing my initial Homebridge instill and using your proceedure to run Homebridge after boot, I’ve been swapping out plugins to try to find one that works properly with my Chamberlain garage door opener which has been a challenge. So, I’ve been removing plugins and changing config.json file info accordingly. Do I need to be moving these changes to the files under the homebridge user that was created by following the exact same steps? Seems that I have 2 different instances of homebridge running now based on executing homebridge command from the root user and then running the “systemctl status homebridge” command based on the fact that there are 2 different homekit codes being shown. Your help would be appreciated! One other point I forgot to mention… I am not able to connect to homebridge from the home app on any of my devices.. So it run successfully but you can see it on an iOS device? Yes I would move them to the config.json file that you moved under the homebridge user. Do they both start when you restart the pi? Correct. I ran successfully but I can’t connect to homebridge from my ios device. That said, it seems that I have 2 instances of homebridge running at the same time under root and then var/homebridge. So, any changes made need to be moved to the homebridge user folder correct? Yes you do not want to versions running. Try move everything under homebridge. – So I restarted the rpi3 and logged in. As you can see when I run homebridge command manually from the /var/homebridge director it loads the homebridge-chamberlin plugin and everything seems normal except for the DNS error. Any suggestions? *** WARNING *** The program ‘node’ uses the Apple Bonjour compatibility layer of Avahi. *** WARNING *** The program ‘node’ called ‘DNSServiceRegister()’ which is not supported (or only supported partially) in the Apple Bonjour compatibility layer of Avahi. [2018-2-7 18:23:22] Loaded config.json with 1 accessories and 0 platforms. Feb 05 19:49:55 raspberrypi3 homebridge: [2018-2-5 19:49:55] Homebridge is running on port 34725.
thanks for your nice tutorial. Everything works – except: https://www.npmjs.com/package/homebridge-cmdswitch2. My bash script is killed directly after the start. If I check the status of systemtcl I see my new PID from my bash-script for a couple of seconds (under CGroup). Any hints? No that seems strange. Are you not getting any errors? not really … attached you will find a screenshot before and after the cmd_on command of cmdswitch2. As you can see, it starts the mplayer but the mplayer will be closed within a couple of second. Afterwards it looks like the first status report. My guess is its a permission issue. It may not be able to write to a file or folder. hmm I have chown and chmod the location of the folder which contains the scripts. Do I need any other special settings? When I use homebridge without the service, everything works. Feb 13 01:08:15 raspberrypi systemd: homebridge.service: Unit entered failed state. Feb 13 01:08:15 raspberrypi systemd: homebridge.service: Failed with result ‘exit-code’. Does it work when you run HomeBridge manually from the command line? Hey, im having the exact same issue. Hello. I was following Tim’s instructions in the article and encountered the same error as you do. The issue could be due to NPM trying to access the .config folder for user homebridge. After the 4 steps, the homebridge service should run fine. Check your logs again to confirm. Hey Tim thank you very much for the guide! Feb 16 10:14:18 raspberrypi systemd: homebridge.service: Failed with result ‘exit-code’. Hey, great guide and easy to follow. I’m an absolute n00b so please bear that in mind. I’m not sure what this means or how to correct that? Any assistance would be appreciated. Thank you. Actually, ignore that. I forgot to delete /local/ from step two. For anyone else who is having the same issue, here’s the n00b explanation. At step 2, enter ‘sudo nano /etc/systemd/system/homebridge.service’ and the gist you need to paste is below. What I hadn’t done is delete /local/ from ExecStart=/usr/local/bin/homebridge $HOMEBRIDGE_OPTS but the correct gist below has it removed. Thanks glad you got it to work!! however cannot the life of me get it to auto start! Ok this might be a stupid question but how do you stop home bridge now? I tried “killall homebridge” command. but does not work anymore. Thanks for great tutorial. Sorry really new at this pi thing. I really can’t get this to work. Homebridge works just fine when starting manually. But as a service is says it’s running but my harmony plugin does not work, I can flip the switches etc but nothing happens. Really strange. please help. I don’t actually think i need it to start at bootup. if i can’t fix this, how do I delete all of these new directories/rules to not affect homebridge. on a related note. I’ve tried resetting my homekit from my iPhone. I now have no accessories connected to homekit. when trying to add homebridge back in (via my macbook, which is still currently working) it says already added. how do I get everything back to working? Hi thanks for setting up this guide. I’ve come back to it several times and I *did* have a working setup for a while until I installed a new plugin. Could you help with an issue I got when installing a plugin? Rather than cross posting, here’s a link to the error output log in case someone else has the issue. Hello guys, I had a different issue which got me a hard work (I’m beginner). I’m posting it in case that would help someone out. Mar 16 22:54:35 raspberrypi systemd: homebridge.service: Unit entered failed state. Mar 16 22:54:35 raspberrypi systemd: homebridge.service: Failed with result ‘exit-code’. which solved the problem. I hope this will help someone else. Thanks for sharing glad you got it to work! Thanks!!! Finally got it rigged up with helps from these instructions. However I had to completely change the path for homebridge; I used the command “which homebridge” to locate the path, and then just used that result in the line where you mentioned removing “local”. That’s great thanks for sharing! having trouble getting this to work on my pi. homebridge runs fine when started directly but not with systemd. Not sure what the issue is because it runs fine when started manually. Any help will save my sanity, have spent hours on this already! Hi RIK! have the exact same issue! did you managed to find a solution by chance? Hmm sounds like a folder or file permission changed? Did you make and recent changes or upgrades? Yes, the recent change was to remove 1 plugin that I installed for test purpose. Also NPM was updated. I have checked the log journal and saw that the system still tries to look for that plugin and can’t find it as I removed it with NPM remove cmd line and removed as well from config.json. I also emptied the persistence folder and also checked that nothing was in acc.cached folder. Could you please let me know how much config file do you have on your system and how many there should be? Yes you should have 2. One is from the original install. Since I have a plugin that requires root privileges, like running “sudo homebridge”, how can I configure for systemctl? I tried giving root privileges to the user “homebridge” by “sudo usermod -a -G sudo homebridge” but it isn’t doing the trick, any suggestions? Since I have a plugin that requires homebridge to be run with root privileges like “sudo homebridge”, how can I configure for systemctl? I tried by giving root privileges to the user homebridge by “sudo usermod -a -G sudo homebridge” but it is not doing the trick, any suggestions? I seem to have run through all commands to set up Rpi but can not find acce3ssory in Home App. then run below in putty and it shows fails. Apr 08 15:39:54 raspberrypi systemd: homebridge.service: Unit entered failed state. Apr 08 15:39:54 raspberrypi systemd: homebridge.service: Failed with result ‘exit-code’. Hmm did it work before you tried to setup the homebridge service? this was working last year. after a holiday came back to fail. since then have tried averything. from new Pi, to many times reformatting, loading and starting. Why is it saying homebridge.system disabled, when everyone else says enabled? Hi Tim, I to am a newbie, but was able get through your instructions with no issues. Thank you. Just one question… Where do I go to find the output of the executing homebridge? All the commands I entered up to step 9 worked fine. Any idea what caused the Invalid Argument? i’m using a newer Rpi with the latest software. I have homebridge running well and just wanted it to boot on launch. Anybody ever tried to save every data from homebridge accessories (temperature, door open/close/ motion) and save them on a sheet or on a server ? Does it mean that each time an accessory is added to the ~/.homebridge/config.json file, the config file in /var/homebridge/ has to be updated manually as well?? ok thx for your reply! 🙂 will try this and let you know. On reboot the “Smartthings” accessory not working but nest is working. Apr 22 19:51:23 raspberrypi systemd: homebridge.service: Unit entered failed state. Any chance you would have any advice? Most likely a permission error. Make sure your folder/file permissions are correct. Thank you! I tried deleting the user entirely after attempting to fix the permissions, but it may not have worked all the way because when I got down to step 4 it said it existed… Anyway, I was able to remove the folder completely and start again from there. My last resort was to completely wipe the SD card and start from scratch… Luckily it didn’t have to come to that. then just run homebridge manually from the terminal then the devices in Homekit all work as expected. Make sure your permissions are correct for the homebridge folder. Thanks Tim, I have figured it out. The setup was correct following your guide above, the issue I had was in my config.json file. Specifically with syntax in the accessory section. I had a rogue character that once removed, I rebooted and all worked fine as expected. I followed your guide but bI’m getting this error when I check the status of the service. What have I done wrong? May 03 17:49:23 raspberrypi systemd: homebridge.service: Unit entered failed state. Check to make sure your folder permissions are correct. Once I’d done that and re-ran the commands in Steps 8-10 the service started perfectly and has ran ever since. Thanks for the great and simple guide from someone with no previous linux experience. ExecStart=/usr/local/bin/homebridge $HOMEBRIDGE_OPTS to ExecStart=/home/pi/.homebridge something goes wrong at the end. I was expecting this to be wrong but what is the correct path? Try adding $HOMEBRIDGE_OPTS to the end of the path. Yup, I already tried that but that did not solve it unfortunately. I am still trying to find out which directory should be filled in on the ExecStart line. In my /usr/bin (or even /usr/) I don’t have a homebridge directory. The location where the config.json shows up is /home/pi/.homebridge but I already understood that the home directory cannot be used for services. [5/6/2018, 6:23:25 PM] Plugin /usr/local/lib/node_modules/homebridge-fibaro-hc2 requires Node version of >7.0.0 which does not satisfy the current Node version of v4.7.0. You may need to upgrade your installation of Node. [5/6/2018, 6:23:28 PM] There was a problem reading your config.json file. thanks for the guide. Unfortunately, I had some troubles running homebridge at the startup when I finally realize where was the mistake: the right path in the steps 4, 5, 6 and 7 (at least for me) is /var/lib/homebridge/ and not /var/homebridge. After I created the folder, moved the file and assign the right permissions I got HomeBridge to start. I hope that will help other users. I tried looking on the Nest app with no luck, also tried using apps such as Insteon+ and Ezzi Home but they can’t find any new devices, although Ezzi Home did find my Homebridge, but I don’t see any options to get it working, just that Homebridge is running and the version history. Anyone got any ideas? My Soma smart shades plugin is not working under systemctl start homebridge but works when I start Homebridge manually. It uses control.py. Any ideas what I can do? Usually, this is a file or folder permission issue. Make sure the homebridge user has the correct permissions to access the folders it needs for the application. Glad it’s help! What do you mean push the link button? Followed your instruction and all is good now. Thanks for a detailed and well-explained how-to. Great write up for people that don’t care too much about what each step does. You may want to include a section on accessing the log remotely. The command is mentioned in your homebridge file. Mentioning that you can enable extended logging might be a good idea too. This gives you a whole bunch more information than systemctl status and also the QR code for homebridge. Thanks for sharing! I’ll add these to the guide. Hi, I have this working just fine for a LED strip on Homebridge. I since have added CMDSwitch2 for ps4-waker and even though my config containing ps4-waker has copied over; it does not boot the CMDSwitch2 plugin or even appear to try to. It only boots my original plugin from when I first did this (no errors either). What step an I missing for adding new plugins to this? The plugin registers through the normal Homebridge execution, although errors due to the port already being used by this method of running Homebridge. Thanks in advance. I’m a noob when it comes to Raspberry Pi and Homebridge. This tutorial was so simple and worked perfectly for me. Thank you! Is there any way to delete the original homebridge? Any reason not to delete it? I need your help! If I start homebridge from you tutorial, the live stream from camera do not work-loading; snapshot is working fine and refresh after 10s, also other sonoff and netatmo plugin works. Everything works, just live stream not if I enable auto boot. But if stop systemctl homebridge and start homebridge manually-just type homebridge, the live stream from camera works perfect. But with no auto boot. Possibly a permission error. Does the livestream need access to files or folders. Try giving them permission from the homebridge user. Thanks, this helped: sudo usermod -a -G video homebridge. Hello Tim everything was working fantastic until the electricity turn off for 30 mins ! That is strange. Did something update? I ended up on your blog following links from the official repo and successfully installed my home bridge as a service on my raspberry pi zero W so thanks for taking the time to write all the instructions down. I would fix one thing though. This is a terrible security practice and should not be encouraged. config.json in this folder is a sensitive file as it will most probably contains password or tokens to access different accessories. This step makes the whole folder readable, writable and executable by any accounts on your machine. The only user that needs to be able to read this file & folder is `homebridge`. Thanks for this suggestion. I will update the step. Just a thought since the file may contain passwords, making it readable is still an issue correct? Thank you, it worked perfectly for me, including Jeromes security suggestion from August, 4th. Hello, a really great contribution. Far as I have never come to me. Unfortunately I still have a small problem with [Sensor] i2cOpen: Permission denied. I use the Homebridge with a BME680 sensor. It works with manual startup via “Homebridge”. [2018-8-22 17:50:08] Loaded config.json with 1 accessories and 0 platforms. [2018-8-22 17:50:14] Homebridge is running on port 51826. Aug 22 17:44:56 raspberrypi homebridge : [2018-8-22 17:44:56] Homebridge is running on port 51826. Thanks! Make sure the folders/files that sensor 2 use, homebridge user has rights to modify etc. when the service loads auto it says 0 devices found and should check API key. when i start it manualy from [email protected]:~ $ homebridge is starts ok. Most likely a permission issue. Make sure the user has rights to the folder. the var\homebridge folder is set to everyone. do i have to set the following also to everyone? first: great help! thanks for the detail and above all for being there!!!! “sudo systemctl restart homebridge” THEN the service starts…. Do you have a tip please? Thanks! That is a strange issue since it works when you run the restart command. Are you seeing any errors? Is it possible you don’t have an internet connection on reboot and it fails to get the weather data? So… when VNC was up, WiFi was up of course…. and till then homebridge could have tried to start and Internet was not there…. a) if a service fails to load eg DarkSky (weather) would Homebridge still not load and be up, just without the service? b) in the restart on boot… even if it did not start because of DarkSky not being reachable….. would it not try again to start? Thanks so much for posting this! I’ve followed all instructions and doesn’t look like I have any errors. The Apple Home app cannot see my hub automatically or when I type in the code. What am I doing wrong? If you start home ridge manually does it work? I use the EVE app as a middle man. Download EVE on Apple device and add Homebridge. @TIM Works like a charm. Thanks man! Oct 07 11:30:17 AnsariHome systemd: homebridge.service: Unit entered failed state. Oct 07 11:30:17 AnsariHome systemd: homebridge.service: Failed with result ‘exit-code’. Does it work when you manually run it? The most common reason people have issues is folder and file permission errors. Double check the user running homebridge has access to the folders it needs. Thanks for responding. I sorted my mistake out in the meantime. I had to remove local from the /usr/bin path following your instructions, which I had initially overlooked. After that, everything worked perfectly. Thanks a lot for putting this together. Thanks for your guide, it helped with a lot issues which I hand with the original guide. Glad you got it to work. So not using homebridge as the user worked? Okt 10 18:05:26 raspberrypi systemd: Started Node.js HomeKit Server. Okt 10 18:05:32 raspberrypi homebridge: [10.10.2018, 18:05:32] Loaded config.json with 8 accessories and 2 platforms. Okt 10 18:05:34 raspberrypi systemd: homebridge.service: Unit entered failed state. Okt 10 18:05:34 raspberrypi systemd: homebridge.service: Failed with result ‘exit-code’. Okt 10 18:05:37 raspberrypi systemd: Stopped Node.js HomeKit Server. Please can you help me, I don’t know how is the problem. Okt 14 10:52:26 raspberrypi systemd: homebridge.service: Unit entered failed state. Okt 14 10:52:26 raspberrypi systemd: homebridge.service: Failed with result ‘exit-code’. Okt 14 10:52:34 raspberrypi systemd: Stopped Node.js HomeKit Server. Hi! i have got this output during the check of the homebridge status with the command “systemctl status homebridge”. ott 16 21:47:32 raspberrypi systemd: homebridge.service: Unit entered failed state. ott 16 21:47:32 raspberrypi systemd: homebridge.service: Failed with result ‘exit-code’. thanks you. it seems that’s working now! ott 21 17:02:46 raspberrypi systemd: Started Node.js HomeKit Server. ott 21 17:02:49 raspberrypi systemd: homebridge.service: Unit entered failed state. ott 21 17:02:49 raspberrypi systemd: homebridge.service: Failed with result ‘exit-code’. ott 21 17:03:00 raspberrypi systemd: homebridge.service: Service hold-off time over, scheduling restart. ott 21 17:03:00 raspberrypi systemd: Stopped Node.js HomeKit Server. I made some mistakes following a different how-to, but this fixed it for me! I have been trying unsuccessfully for the past 2 days to get this working and I must be missing something vital. Homebridge launches successfully from Terminal and when I follow the instructions, it launches successfully using the command “sudo systemctl start homebridge” in step 10. BUT when I power cycle the Raspberry Pi, the program does not restart and all accessories show “No Response”. Nov 01 20:09:55 raspberrypi homebridge: [2018-11-1 20:09:55] Homebridge is running on port 33607. I followed your instruction and Im able to run homebrigde manually, but when starting systemctl its becoming inactive after few seconds. What could be the probelm? No, It starts, and in few seconds later status says – inactive.. Any ideas? Does it work running it manually? Dec 01 17:05:12 raspberrypi systemd: Started Node.js HomeKit Server. Did you try removing the homebridge user from the homebridge.service file? In the gist they are using `HOMEBRIDGE_OPTS=-U /var/lib/homebridge`. Regarding to `var/lib/homebridge` you have switched to use `var/homebridge` without any note in your article. This could cause some problems if people mix up your and the gists sources. Maybe a hint is a good idea? Thanks for your content and great troubleshooting guide. Dec 23 01:35:00 raspberrypi systemd: Stopped Node.js HomeKit Server. Dec 23 01:35:00 raspberrypi systemd: Started Node.js HomeKit Server. 0 accessories and 1 platforms. Dec 23 01:35:03 raspberrypi systemd: homebridge.service: Unit entered failed state. Dec 23 01:35:03 raspberrypi systemd: homebridge.service: Failed with result ‘exit-code’. Thanks! Did you try removing the User=hombridge from the homebridge.service file? 1. on reboot I don’t get a terminal in which I can see what homebridge is doing. Is there (Like screen) a possibility to re-attach? 2. there is a config.json in pi/.homebridge as well as in var/homebridge (it is copied during the tutorial) I should use the second one when I want to update my accessories and platforms right? Can I remove the first one? 3. When I end the service bij “systemctl stop homebridge” and I type Homebridge, home bridge reads from that first config.json (in pi/.homebridge) is that correct? I wanted to thank you for your great post on how to start homebridge on boot. Very thorough and accurate. It would have worked on the first try had I not skipped a step. When I corrected that error, it worked flawlessly. yes it works when I run manually but it look like homebridge does not start on boot. I’ve tried removing homebridge user from the services file but I get same issue. And i need it to work on boot. « Try later, too many request » . It looks like start on boot stuck the connection to the tahoma account. First of all thanks for the solution! Is it work with Homebridge-alexa too? I copied it with File manager, but finally not work. The service stus is working, but in my phone not. Just wanted to say Thank you! I got so close but was just missing a few things, the exact few things you had issues with. All setup and running now! Just a simple question. If I install new plugins and accessories, should I update the files in /var/homebridge ? Thanks! Yes keep /var/homebridge/ config updated. Hi again Tim. Unfortunately my homebridge was broken after I did everything you mention. Are you running it as sudo? Yes. Followed the steps as you described them. Jan 15 12:25:52 raspberrypi systemd: homebridge.service: Unit entered failed state. Jan 15 12:25:52 raspberrypi systemd: homebridge.service: Failed with result ‘exit-code’. Did you try removing the User=hombridge from the homebridge.service file? Does it work if you manually run the command to start homebridge? Hi Tim! Thank you so much for your work, very appreciated. I am trying to add an accessory to HomeKit mekit and I am getting the following error when running homebridge since it is already running automatically. How can I add an accessory while homebridge is automatically running? You are welcome! Try restarting the service. It should pick up the change. [2019-1-20 12:21:33] Loaded config.json with 4 accessories and 1 platforms. This has solved a lot of my issues, thank you. I am having a problem adding new plugins to my homebridge now. Whenever I try to enter a command like npm install -g homebridge-nest, I am getting a lot of errors. At a high level, is there any differences I need to do when adding plugins to my homebridge? No there should not but I guess it depends on the plugin. Also I had to remove “local” but now it works. When I started it manually i use the flag “-I” to se the devices in the web browser “homebridge -I” (“I” as in I’m). Where exactly should I put this flag now? (please be specific, as in what file, and where , I am noob still). thanks for all your help, I followed your instruction and it is all working perfectly except one plugin. I tried to remove “User=homebrige” but that caused home bridge not to run on boot. Great job! My first thought could be that the service is starting before your device has an ip. You could try adding a delay to the execution of starting the service. also is there a command I can use in the config file to restart homebridge if the delay doesn’t work. I searched but you are the guru, I don’t want to mess up. so I just sudo systemd restart homebridge and it loads fine. Feb 02 12:22:38 raspberrypi systemd: homebridge.service: Unit entered failed state. Feb 02 12:22:38 raspberrypi systemd: homebridge.service: Failed with result ‘exit-code’. I’m very new to working with any sort of code, but the error keeps apparently point to the $HOMEBRIDGE_OPTS, which is under the step where you say to remove the local direction…I’m not sure if I’m doing that correctly. I’ve been pasting that command in my remote terminal, but it won’t fix the error. Can you point me in the right direction please? This is working great so far. The only issue I seem to have is that anytime I add a new accessory to config.json, it doesn’t show up in Home unless I copy the config file and restart homebridge. Is there any way around this so that anything added to the config.json file will automatically work and show up in the Home app? Great! Try just adding your device to the new config and restart the service. Thanks for the write-up! I’m a total noob, and have a question that obviously isn’t a problem for anybody else here. After I copy the gist, what command do I use to “save” it or whatever to continue to the next step? at first, I would like to say thank you for the great job! I have a question for you. I am trying to solve problem, how can I define, which version of node.js will run with Homebridge. When I am running Homebridge via command, app will start with node js v11.12.0, every plugins is working normaly. When I am runing homebridge with Bootup, probably it start with node js 8.9.0. That is the reason, why newer plugin cant run correctly. Main problem I have with Xiaomi robot vacuum cleaner. I tried everything, how to update node js in Rasp pi. I tried to uninstall node js. Everything was not working. Is there some way, how to define correct node js version for homebridge.service? Thanks a lot for this! Sadly, thus far it won’t run when I boot it up. The first thing I’m trying to do is remove the user=Homebridge from the homebridge.service file, but it won’t let me! I am a total NOOB in case that wasn’t clear:) Root is the owner of the file, do I log in as Root and change it? How? apr 18 00:04:05 raspberrypi systemd: homebridge.service: Unit entered failed state. apr 18 00:04:05 raspberrypi systemd: homebridge.service: Failed with result ‘exit-code’. apr 18 00:04:13 raspberrypi systemd: Stopped Node.js HomeKit Server. Glad it’s helped. Try adding “sudo” in from of the command when you are editing the file. Let me know if that helps.